Veteran Writers Pop-Up Showcase So Say We All is hosting this storytelling showcase through its Veteran Writers Division. The new, original stories are part of the the Creative Forces: NEA Healing Arts Network. Join them and partners Resounding Joy, Combat Arts, vetarts.org, Vets Community Connections, and San Diego Veterans Coalition at the Novo Brazil Brewing Company in Chula Vista.Get more information about the Pop-Up Showcase. November Meeting Recap Remember the Tuesday night Writers Read, 6 to 7:30, Nov 13 at the Fallbrook Library. Come and bring your friends.Dark FactorHere’s the article Ron mentioned and a website where you can do a self-assessment. This can be really helpful in developing dark personality traits in your writing. The Dark Core of Personality Determine your Dark FactorWant to do some preliminary genealogy or work on a memoir?Findagrave.comfamilysearch.orgSee Autosomol DNA Test Company comparison belowJoin us December 1 for our next meeting. Oceanside Library Writing Groups Oceanside Library has two writing groups, one that meets at the Mission Branch on the second Sunday of each month at 2:00 pm, and one group that meets at the Civic Center Library, second floor Foundation Room on the 2nd & 4th Monday at 6:00 pm. The next meeting will be on September 24 at Civic Center Library. Here is a link to the flyer in case you want to share with the group. Contact Hilary Holley, hholley@cloceanside.ca.us for more info. Listen Up! Book Launched Our second book, Listen Up! Things I Learned From the Military, is published. 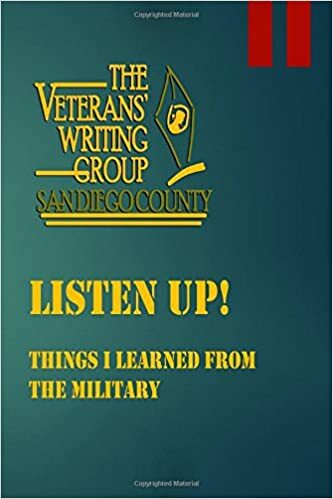 Thanks to everyone who made our May 26 launch event such a success.Two of our authors provide more information about the book in an interview featured on CBS8 TV in San Diego.See Listen Up! on Amazon here. Dime Stories The San Diego version of this open mic for writers is the second Friday of every month at Liberty Station. The group offers a showcase for your writing with a forum for "three-minute stories read by the author at live open mics, showcase events, online, and on the radio. "Go to DimeStories online for more information or to submit your story for a future meeting, or go to their Pt. Loma meetings in Barracks 16, Suite 202, at the old NTC. Fallbrook Writer's Read Readings are the second Tuesday of each month (except July and December), from 6:00 to 7:30 p.m., in the Fallbrook Library Community Room, 124 S. Mission.Next meeting is August 14 - an open mic night for poetry and prose.For more information, visit the Fallbrook Writer's Read online, or contact the coordinator, K-B Gressitt, at 760-522-1064 or kbgressitt@gmail.com. San Diego County Grant We have been advised by Supervisor Bill Horn's office that we are to receive a grant for $5000 from San Diego County.Thanks Supervisor Horn and Garry Garretson! Tom Calabrese, recently won VWG is proud to announce that one of their members, Tom Calabrese, recently won The Saturday Evening Post's Tribute to the Troops essay contest. Read his award winning essay here. Gene Simmons Military Tribute After getting to shake his hand a few weeks ago, this was sent to me. Mr Simmons, thank you for supporting our troops and veterans. Welcome As we grow, so does our website. Please join us in leaving your comments and help us make this site a better place for all Veteran Writers to visit and draw from.